[0:02] <shiftplusone> what's the output of tvservice -s ? [0:08] <DoctorD90> guys? raspberry has a bios with boot options? [0:09] <shiftplusone> I mean 'no' in the direct sense, but 'maybe' in the sense that you can get a menu with some boot options if you want it. [0:11] <shiftplusone> Nuh, that's x86 stuff. [0:11] <DoctorD90> what do you mean with msybe? [0:13] <shiftplusone> DoctorD90, the pi is fairly dumb in that sense. It just loads whatever is on the sd card. So you can put a bootloader on the card which will allow you to display the sort of menu you're talking about. [0:13] <shiftplusone> The official version of such a thing is 'NOOBS', but there is 'BerryBoot' as well, and for the more advanced, uboot. [0:14] <shiftplusone> Tacker, on the fat32 partitions of the card. [0:15] <shiftplusone> DoctorD90, not grub exactly, but that sort of thing. [0:15] <DoctorD90> but rpi read only from sd? i cant use usb? [0:15] <Tacker> and where would that be ? [0:15] <shiftplusone> DoctorD90, the pi can read usb fine, it just can't boot directly off it. You can install an OS to USB and just use the sd card for booting. [0:16] <shiftplusone> Tacker, My psychic powers don't extend that far. [0:17] <shiftplusone> DoctorD90, Grub is designed for x86 computers. There may be some ARM ports, but I haven't seen anything like that used on a pi. [0:18] <shiftplusone> Tacker, you shouldn't have to. The specific file you're after is on /boot. But, if you want to check anyway, you would check the partition table using something like cfdisk or gparted, then mount the relevant partition using the 'mount' command. 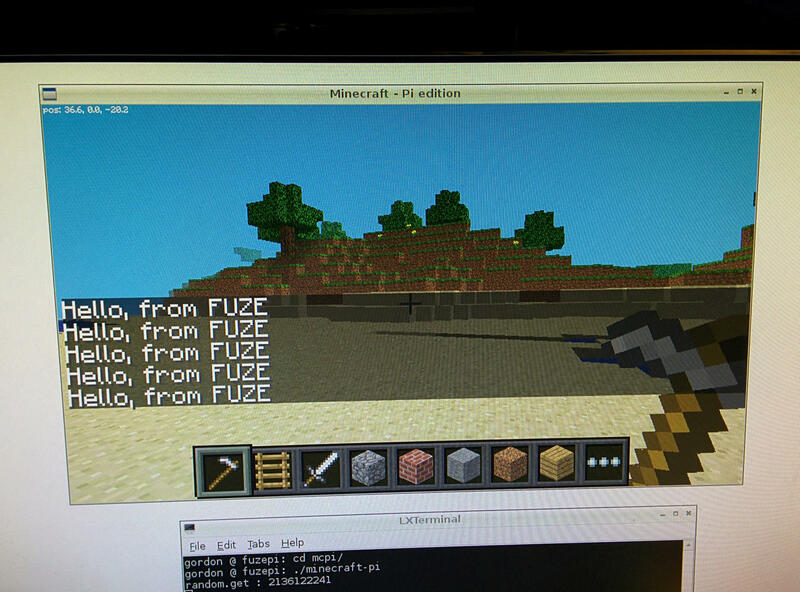 [0:19] <shiftplusone> Tacker, note that NOOBS adds text to the bottom of the config file. So if you have a line commented out at the top or conflicting with what's at the bottom, it won't have any affect, so make sure you check the whole file. [0:19] <Tacker> oh ok. hmm but the file i edited and commented the hdmi output line is the exact file. But raspbmc is working right now, so i got that going on for me. [0:35] <DoctorD90> if i connect rpi to hdmi it auto set hdmi? [0:35] <shiftplusone> what do you mean by auto set? [0:36] <Laseryoda> If I have a wall outlet adapter which outputs 5V DC, 2.1A, will a USB 2.0 chord suffice to power the RPI? [0:38] <Laseryoda> "A device may draw a maximum of 5 unit loads (500 mA) from a port in USB 2.0; 6 (900 mA) in USB 3.0." [0:38] <Laseryoda> If I have a model b, won't I need a USB 3.0 chord? [0:38] <DoctorD90> shiftplusone: i mean, once i get rpi, can i connect to rca or.hdmi, and it auto choice the rigth output? [0:39] <shiftplusone> Laseryoda, If you can find a usb cable which can't handle the current drawn by a pi, I'll send you $10. [0:40] <shiftplusone> DoctorD90, usually, yes. NOOBS does something silly by forcing HDMI, but you can change that. [0:42] <Laseryoda> "Typically, the model B uses between 700-1000mA", what's the point if USB 2.0 only supports 500mA? [0:42] <shiftplusone> Laseryoda, those specs are for devices, not for the cables. [0:43] <shiftplusone> note that there are many terrible usb cables which won't work on the pi. [0:43] <shiftplusone> some have a high resistance, so you lose half a volt or even more in the cable alone. [0:43] <Laseryoda> Will https://www.komplett.se/hama-universalladdare/618824 work? [0:43] <DoctorD90> Voltage must be the same as required from rpi (5V) but amper can be what you want, from 700mA (0,7A) to 1milion amper....understand ;) ? [0:46] <shiftplusone> Laseryoda, there's not much information on that page. As a general rule, genuine phone chargers from Samsung, Apple, HTC and so on work pretty well (with the exception of one specific US model of an Apple charger). [0:47] <shiftplusone> can't always tell just by looking at the price, but yeah. [0:51] <DoctorD90> by the way, so i can connect hdmi or rca without issues, and without set manually nothing? [0:52] <shiftplusone> As an analogy, a table may support 500kg, but that doesn't not mean you weight 500kg if you sit on it. [0:52] <Laseryoda> DoctorD90: that adapter says 5V 1A, should be good, no? [0:53] <shiftplusone> DoctorD90, The pi itself only uses about 300-400mA. The 0.7A is taking into account that you will attach stuff. [0:57] <shiftplusone> Laseryoda, why are you looking for an adapter when you already have one anyway? [0:57] <Laseryoda> shiftplusone: U mean the one from before? [1:21] <DoctorD90> in gpio i have 3.3V and 5V ....but everywhere i read that gpio doesnt give 5V and.it is very danger to use 5V instead 3.3v pin....why? [1:24] <DoctorD90> so i can get 5V from 5V pin, and 3.3 form 3.3 pin, but i have to be care (sorry my bad english) thay devices not go up to 5v? [1:25] <DoctorD90> and take care that 3.3 is in 3.3 pin and, 5at 5v? [1:26] <DoctorD90> so 5V -> ground and no other connections ? [1:26] <phire> what exactly are you trying to do? [1:30] <phire> what kind of circuits? [1:34] <DoctorD90> ah understand...it is so easy for.me xD 3.3 is 3.3, 5 is 5 ....why they would complicate my life? 3.3 in3.3, 5in5! obliuvlsy! [1:35] <DoctorD90> ah! yea! level shifter! my next question! [1:38] <DoctorD90> tolerant was my problem xP ...level shifter, that cost 7$ on adafruit if i remeber well...what exactly do? [1:38] <DoctorD90> check for v in each pin? [1:38] <pksato> DoctorD90: if you set a some pin to input (or output) and connect it to 5v, you destroy internal circuit of CPU. [1:39] <phire> Level shifting is complicated. [1:40] <pksato> and, 5V is a standard voltage used on TTL (1970) tecnology. [1:40] <pksato> Lots of device use 5V. [1:41] <pksato> but, today tecnology use other voltages, like 3v3, 1v8 and less. [1:42] <pksato> RPi use 3v3 and 1v8. 5v remain due USB power are 5V. [1:42] <pksato> and, also 3v6. [1:44] <pksato> some chips can handle voltage above it power supply. [1:44] <pksato> but, rpi Chip can not. 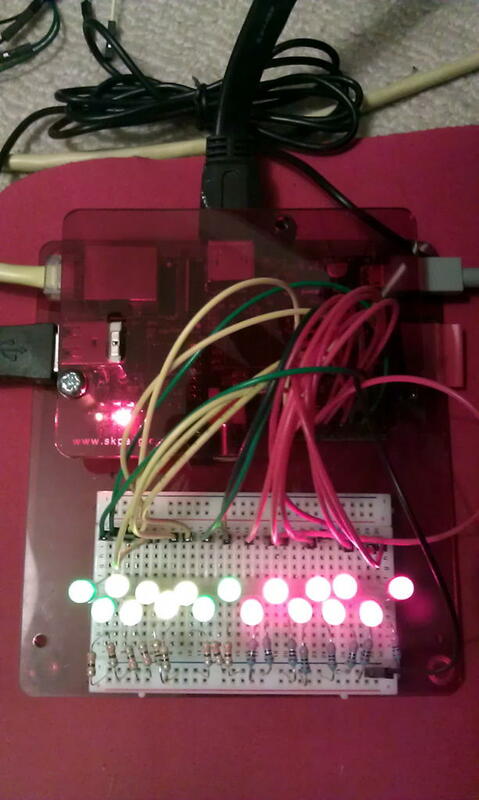 [1:46] <pksato> DoctorD90: on theory, all other circuits connected to RPi GPIO must be work at 3v3. [1:50] <DoctorD90> and use some chip/board that manage multiple devices...can you suggest me a good/board/chip? [1:50] <DoctorD90> matt what do you mean? [1:51] <pksato> dc engines? motors? [1:52] <pksato> RPi is not good for power control. [1:54] <pksato> use 3v3 devices. [1:54] <pksato> avoid 5v device. [1:55] <pksato> A big one? [1:56] <DoctorD90> but i have purchase this weekly books? [1:57] <DoctorD90> is a normal weekly edition or similar, or.guys.that love rpi and write in spare time? [1:57] <pksato> no. magpi is free. but, you can buy a printed version. [2:06] <DoctorD90> looking for some.other distro for arm processor, i have seen ARMHEL and ARMFEL or similar....i have.understand that there is different type of arm processors. what it the type of rpi? [2:09] <DoctorD90> armhf and armel...this is kind i have found...what.is the differences, and.how i know what kind will be mine? [2:24] <DoctorD90> guys, im tired...it late for me...thx of all support!!! i think i.will handle.here! thx of all :) good nigth! [2:56] <tonsofpcs> trying to gpio write and I get an error that there is no access to /dev/mem, try running as root... is there any option other than running as root? [3:03] <[Saint]> There's a rather disturbing amount of raspberry pis out there using the default user/password combination for the distro. [3:04] <[Saint]> I've only been scanning for a few hours, and I've managed to find a few dozen. [3:04] <[Saint]> If it touches the net...that's a really bad idea. [3:05] <[Saint]> I'm only trying the default Raspbian and ALARM user/pass combinations, and only via ssh on the default port (22). [3:06] <[Saint]> If I widened my scope a bit, I'm willing to believe I could find some more. [3:06] <[Saint]> Considering the grander scale of things, and how many of these devices are out there in the world, finding a few dozen left wide open and net connected doesn't surprise me too much. [3:07] <[Saint]> Also the rather low barrier to entry probably plays a part in this. [3:07] <[Saint]> One can trivially start messing around on a raspi whilst having absolutely zero understanding of network security. [3:09] <[Saint]> I should probably stop this, as the legality (varies by locale) and morality (assumedly a global constant) are very questionable. [3:10] <[Saint]> I would *really* love to drop a file in the user dir stating what happened and how - but that definitely crosses the line and could well wind me up in prison. [3:12] <[Saint]> I would like to dump a "README.txt" file in ~ with content along the lines of "If you're reading this, you left SSH open and are still using the default password for the username of this account. You should definitely not do this. Here are some steps you should consider taking: ..."
[3:13] <[Saint]> But, yeah. Modifying a users filesystem remotely without permission...nope nope nope. [3:14] <[Saint]> zz_Kymru: just a simple script I knocked up to recurse through a range of addresses trying the default username/password combinations via ssh on port 22. [3:15] <[Saint]> It does 4 attempts at a time, an attempt takes roughly a few seconds. [3:16] <VoidFox> found anything beside honeyboxes? [3:16] <[Saint]> I don't go looking, I just log success/fail. [3:18] <[Saint]> Just under two dozen after letting it run for slightly over 2 hours. [3:21] <zz_Kymru> [Saint], did you try that IP? [3:23] <[Saint]> Didn't get it. [4:40] <tonsofpcs> so, what's the best web server I can run to serve up a html5 page with two buttons on it each of which will end up just calling a shell script? is tomcat enough? [6:39] <Taylor> Are brackets to group commands valid in crontab? [6:44] <Jusii> and one more question, why use cron for that? [6:44] <Jusii> maybe just init.d script to be run on boot? [6:45] <Taylor> Are there benefits to using init.d over crontab? [6:46] <Jusii> or is this something else than raspbian? [6:47] <Taylor> I'm not completely familiar with how init.d works, are the contents executed on boot? [6:51] <Taylor> What language is this? [6:57] <Taylor> Is it just bash? [7:06] <Taylor> one fi for every if? [8:19] <rahul__> I am trying to pair my BT headphones with Pi.. But its not performing..
[10:01] <Kymru> rahul__, any luck with the hradphones? [10:28] <klock> what's consensus on controlling big loads with a pi? mosfet? [10:30] <gordonDrogon> klock, whatever your more familiar with. [10:30] <gordonDrogon> klock, and it depends on the load. DC or AC..
[10:31] <gordonDrogon> a PiFace with the relays is very easy. [10:32] <gordonDrogon> personally I'd not use it to switch mains voltages as I feel the terminals are a bit close to the Pi, but I have seen it donw. [10:33] <gordonDrogon> for low (ish) voltage& current DC the uln2003 darlington driver is popular - with 7 or 8 outputs. [10:33] <gordonDrogon> for a single output - a power mostfet might be a good choice. [10:34] <ShorTie> what cha trying to control if i may ask ?? [11:50] <dakira> Hi. I'm looking to run a raspberry pi 24/7 for backup. Anything to consider? I've seen people use heatsinks. Will model B rev1 be enough to run a nightly (large) rsync? [11:55] <gordonDrogon> dakira, it'll be fine without heatsinks. [11:56] <gordonDrogon> rsync will be slow as the Pi isn't the fastest at encryption - if it's on a LAN and peer to peer encryption isn't an issue you might want to look at using rsh rather than ssh, but it's no big deal. [12:02] <dakira> gordonDrogon: thanks. any reason to use model b rev2 (i.e. with 512MB RAM)? If it makes a difference I'll buy it but I have a couple of unused rev1 models that I'd rather put to good use. [12:06] <DoctorD90> i would like make an extruder 3d..not a printer, that "shoots" liquid plastic....someone has ever hear about? [12:07] <gordonDrogon> dakira, only as it has more RAM, but really, rsync, etc. will be fine on a Rev 1. [12:08] <gordonDrogon> rsync can eat a lot of RAM when building up the directory structure though - it keeps a copy of both sides in RAM before the copy starts. [12:09] <gordonDrogon> DoctorD90, you describe what most people would think of a 3D printer - one that extrudes melted plastic... there are many out there - make you own - easy if you can do the mechanicals. [12:20] * SpeedEvil wants a 4D printer. [12:20] <SpeedEvil> It would help a _lot_ with the procrastination issues. [12:21] <gordonDrogon> DoctorD90, so you want liquid plastic, but not melted plastic. do you mean light sensitive liquid polymers? [12:25] <gordonDrogon> the lego is one typically called a mill or router. [12:27] <dakira> gordonDrogon: great.. I'll give it a try! [12:34] <gordonDrogon> DoctorD90, ok - well, that what most 3D printers are. So the alternative is to mill out the plastic you don't want - just like that lego printer. [12:34] <gordonDrogon> but the "proper" device is a CNC Mill. [12:34] <DoctorD90> so im looking for a mill printer? [12:35] <dakira> DoctorD90: what exactly are you trying to accomplish? [12:35] <gordonDrogon> well - printer implys printing something - putting something on a base. you're "subtracting" material. [12:35] <dakira> DoctorD90: for CNC and printers arduinos/atmels are way more popular. [12:35] <gordonDrogon> I'm sure people have done it but I've not seen a CNC mill myself. [12:36] <dakira> DoctorD90: no. i mean what are you trying to accomplish. What do you want to have as a result. [12:37] <gordonDrogon> you may need arduino to do the actual control with the Pi doing the design. [12:37] <dakira> DoctorD90: i've built several CNC mills and I can tell you, you are making it harder on yourself by using pis instead of arduinos. [12:37] <gordonDrogon> the Lego mill there mills stuff called oasis - phenolic foam. [12:38] <gordonDrogon> it's very very soft. [12:40] <doGet> Hi, I am using raspbian How should I run a script automatically on boot ? [12:45] <birabijan> Hi. My TV doesn't passthrough surround via SPDIF, and my receiver has only SPDIF (no HDMI). Should I look for HDMI -> HDMI+SPDIF extractor or there are any cheap USB soundcards supported by Rpi with spdif out? [12:49] <dakira> DoctorD90: sorry. couldn't find a picture on my phone. anyway, what you usually want (for a 3-axis mill): 1. a table to put your material on that can be moved forward and backward by motors. 2. an arc over the table with guides an the side so that you can move your mill up and down. 3. a horizontal guide that allows your mill to be moved left and right. connect all the motors to an arduino and use the free visicut software to control it. [12:51] <birabijan> pksato: yeah, seen that already, I'm not sure whether it supports all formats (AC3 isn't mentioned in desc.). Second one just has 3D support additionally, right? [12:53] <pksato> birabijan: it is just a audio extractor, dont process audio stream. [13:05] <Raynerd> Hi guys... my Raspberry pi running my weather station has stopped again and the SD card has been corrupted and I only get a red light on the Pi - no boot. Obviously, I mean using a new good SD card, just a red light on the Pi! [13:05] <Raynerd> Checked the fuse and that is OK.
[13:15] <DoctorD90> guys, exist a 'card', and adapter to connect mini pci card(from my broken netbook) to rpi? [13:40] <DoctorD90> guys, how i know if raspberry is armel or armhf? [13:42] <ShorTie> opps, nop, what os ?? [13:56] <gordonDrogon> does minecraft on the Pi need a bigger gpu mem split than 16MB? [14:03] <gordonDrogon> yes, is the answer. [14:04] <SirLagz> answer to what ? [14:06] <gordonDrogon> the question I just posted. [14:07] <gordonDrogon> now I need to know how to get the mouse out of a minecraft game without pausing it. or maybe I don't. new to all this. [14:11] <gordonDrogon> the question was: does minecraft on the Pi need a bigger gpu mem split than 16MB? [14:11] <gordonDrogon> and it seems it does - 64MB. [14:12] <pjhartz64> are there servers for minecraft pi, or is it offline only? [14:13] <gordonDrogon> thanks for the inventory tip. [14:14] <gordonDrogon> pjhartz64, AIUI, it's local creator mode only. [14:15] <gordonDrogon> but I think others can connect into your game, so maybe there's more to it. [14:15] <gordonDrogon> what do I know - I'm just trying to write an interface to it in BASIC. [14:19] <pjhartz64> does anyone know the game "Meridian 59"? Its a MMO with Mode 7-like graphics, and its opensource. Wonder if that could be compiled on the Pi. I actually just find stuff about compileing it with visual studio. [14:19] <gordonDrogon> m ... m ... mmmm .... mode 7 ? [14:22] <gordonDrogon> I suspect that might be the initial stumbling block. [14:29] <gordonDrogon> wine won't work as it assumes its already running on x86. [14:48] <AndreeeCZ> hi! whats the dac resolution on rpi? [14:50] <gordonDrogon> AndreeeCZ, what DAC? it doesn't have any. [14:50] <gordonDrogon> or do you mean the analog sound output? [14:50] <AndreeeCZ> gordonDrogon: well the audio output? [16:05] <DoctorD90> guys, on gpio, i find 3v3 x2, 5v x2, and Ground x5. there are differences or advising about using them? [16:07] <DoctorD90> or i have use each one for different purpouse? [16:07] <gordonDrogon> DoctorD90, use what's easiest to use. [16:08] <gordonDrogon> internally all the Gnd's are connected together as are the 5v and 3.3v pins. [16:09] <gordonDrogon> on the Rev 1 docs. the additional 5v, 3.3v and Gns pins were marked "do not connect", but since they never used them on the Rev 2's then they said "ok, do connect if you need them". [16:11] <DoctorD90> gordonDrogon: are you pratice of PWM? (sda/scl)? [16:12] <[SLB]> oh hm, where can i find an updated gpio scheme with the tension values for the old do not connect pins? [16:20] <gordonDrogon> what kind of motors and what language are you programming in? [16:22] <gordonDrogon> ok. sounds fun. [16:26] <DoctorD90> but....what are the differences xD ? [16:27] <smikey> has anyone some gpu-stuff working already? [16:39] <IT_Sean> don't worry... they will send another. [16:39] <IT_Sean> What was it, anyway? [16:41] <IT_Sean> Will this be your first raspi? [16:44] <IT_Sean> Are you going to make some sort of Bionic Alarm Clock of Death? [16:44] <IT_Sean> Will there be an LCD display? There should be an LCD display. [16:45] <IT_Sean> And mebbe some blinking LEDs or something. [16:45] <IT_Sean> When the time comes, Adafruit sell a really nice 2 line ... damn, you beat me to it. [16:46] <IT_Sean> I have the 2 line RGB backlit LCD from Adafruit, for the Pi. It's a nice little display. [16:46] <IT_Sean> And yeah, it's got 5 buttons. [16:46] <IT_Sean> 'course, you can do whatever you want with 'em. [16:54] <DoctorD90> someone that know L293D, MCP230XX or similar stuff? [16:55] <IT_Sean> I am not. [16:56] <IT_Sean> As well you should be. [17:21] <AbbyTheRat> does it work on another device? [17:21] <AbbyTheRat> does aplay still play sounds with other headphones/speakers? [17:22] <AbbyTheRat> IT_Sean: whatever make you think tht? [17:22] * IT_Sean almost feels guilty for having two raspis. [17:25] <tonsofpcs> this could cause odd sounds or no output at all. [17:26] <IT_Sean> AbbyTheRat: Decided on a case yet? [17:26] <SpeedEvil> Me too. You bandsaw them up, and you can make them into glockenspiels. [17:26] <rahul__> tonsofpcs: how to make it right? [17:27] <IT_Sean> I'm kinda partial to the PiBow, personally. [17:28] <SpeedEvil> Solve any height issues. [17:29] <IT_Sean> Nah... hide it away, but desolder the LEDs and put new ones on the face of the cabinet. [17:30] <tonsofpcs> rahul__: are you using the pi onboard sound playout or are you using an external device? [17:31] <IT_Sean> Ooooh, i see... you have spun up a child process. [17:31] <IT_Sean> I still safety is overrated. [17:31] <AbbyTheRat> MY KID IS AN IT! ZOMG! [17:32] <IT_Sean> your kid is an it? [17:32] * IT_Sean sends AbbyTheRat the three page PDF entitled "determining your child's gender in four easy steps"
[17:33] <IT_Sean> They can be trouble. [17:33] <IT_Sean> Or so I am told. [17:34] <IT_Sean> tonsofpcs: you cannot afford my hourly rate, m8. [17:35] <Kymru> i can offord things for myself, but when it comes to the wife...im skint!!! [17:35] <AbbyTheRat> What happen if I'm the wife and I have a wife? [17:36] <IT_Sean> AbbyTheRat: careful... that's only legal in some states. [17:46] <rahul__> tonsofpcs: done, Now? [17:48] <tonsofpcs> have you tried every possible sample rate and depth setting? [18:01] <rahul__> Its 5 hours sspent over this,..
[18:04] <rahul__> tonsofpcs: are you there? [18:11] <tonsofpcs> rahul__: does alsa support it? [18:15] <x^2> If i attempt to attach something to a GPIO pin which needs more current than the pin can give, is there any risk of damaging my Pi? [18:17] <ShorTie> ever hear of that old song, pop goes the wesel ?? [18:18] <x^2> why would that be? [18:19] <x^2> but for other devices, what do i need to consider? [18:19] <IT_Sean> Do not apply more than 3.3v to any input. [18:21] <IT_Sean> that's why overdrawing a pin kills it. [18:21] <x^2> ahhh i gotcha. [18:23] <gordonDrogon> we're supposed to be inteligent in that department. [18:23] <gordonDrogon> that'll be ok.
[18:24] <x^2> that's really all i need to pay attention to, in order to avoid overdraw? [18:24] <gordonDrogon> more or less. [18:25] <x^2> i'm very new to this stuff so im still learning the basics, but now i know what's safe at least. [18:25] <gordonDrogon> jut stick to under 15mA. [18:26] <x^2> thank you very much for the help everyone, i understand now. [18:26] <gordonDrogon> the reason there is no protection is because it's designed to be used by people who understand the limitations. [18:26] <gordonDrogon> protections costs money and when you need to sell 10,000,000 of them then it all adds up. [18:26] <x^2> ShorTie: what do you mean? [18:31] <gordonDrogon> I saw someone drive motors directly off a Pi recently. [18:31] <gordonDrogon> no transistors, mofets, etc. [18:31] <gordonDrogon> they worked quite well too. [18:41] <x^2> i was going to try to use a small motor with mine. [18:41] <x^2> very tiny one. [18:48] <x^2> that doesn't increase my draw, does it? [18:49] <IT_Sean> yes, if you are driving two LEDs you will be drawing additional current. [18:49] <IT_Sean> think of adding the 2nd LED as opening a 2nd water tap in your house. [18:49] <x^2> would i literally just add their two voltages together? [18:49] <x^2> ah, okay. i like that analogy. [18:49] <IT_Sean> you are "pulling" more "powah"
[18:52] <shiftplusone> correct, you add the voltages together, but the current stays the same. [18:54] <shiftplusone> voltage isn't current. [18:54] <shiftplusone> x^2, memorise V=I * R (voltage is equal to current times the resistance). [18:55] <shiftplusone> but do not apply it to LEDS, they don't have a resistance. Apply it to the resistor you have to figure out the voltage drop across is. Then whatever is left over is shared by the two leds. [18:56] <shiftplusone> you won't have enough voltage to light them up. [18:56] <x^2> that's why i didn't think it affected current. [19:03] <shiftplusone> In short, there is a change in current, but it's caused by the change in voltage. [19:04] <x^2> would the 'predefined voltage drop' across the LED be the voltage marked on the LED? [19:05] <shiftplusone> it would be in the datasheet, but it's hard to find one without knowing the exact part number and manufacturer. [19:05] <shiftplusone> so you can often estimate by the colour of the LED. [19:06] <shiftplusone> So they're really operating out of spec then, as there's not enough voltage coming from the pin to power both of them. [19:08] <shiftplusone> I would actually have predicted that if the LED says 2.0V on it, it would not light up if you put two of them in series. [19:13] <trohrt> Would it be possible to tether (for lack of better word) my raspberry pi and use the internet from my raspberry pi via ethernet? [19:14] <shiftplusone> where is the pi getting the connection from and how do you intend to pass it on? [19:14] <shiftplusone> if the pi is getting its connection over wifi, you can forward it to the PC through ethernet, for example. [19:15] <linuxstb> So your Debian computer doesn't have internet access? [19:15] <x^2> can't you plug ethernet cable into it? [19:17] <x^2> and then use Screen to get into it. [19:18] <linuxstb> Does your Pi have a public IP address, or are you just port forwarding the web port (80) from your router? [19:19] <shiftplusone> keep in mind you're not going to get great speeds. [19:21] <trohrt> I want to get my internet connection from my raspberry pi, not the other way around. [19:21] <trohrt> That's fine, thanks for trying! [19:26] <SpeedEvil> Are the LEDs in series? [19:26] <SpeedEvil> Are they blue LEDs? [19:26] <SpeedEvil> Read the datasheet. [19:27] <x^2> so is their voltage on the package not the voltage they actually use? [19:27] <shiftplusone> x^2, you would not actually have 'negative voltage'. It means you don't have enough voltage, which is why I predicted they wouldn't light up. [19:27] <x^2> what is it then? [19:27] <SpeedEvil> At low current - .1mA say - it may be 80% or whatever of nominal. [19:28] <x^2> should i go by the max voltage on the package to be safe? [19:29] <SpeedEvil> If you apply the nominal current, you can expect the nominal voltage. [19:29] <SpeedEvil> If you apply less than the nominal current then the voltage may drop. If it drops far enough, the LED won't be visible. [20:14] <Jeebiss> Hey guys, anyone have experience using an easydriver with a pi? [20:25] <Laseryoda> Hey everyone. How limited am I, power-wise, when using a HDD that is powered through USB? [20:26] <Laseryoda> So I cant just plug it in the RPI? [20:30] <Laseryoda> So, technically, 3.5" HDD (externally powered) is simpler? [20:30] <Laseryoda> U just gotta power it then plug it in the RPI? [20:33] <malfunct> how fast is the ethernet port on the pi? [20:33] <Laseryoda> The RPI has max transfer speeds of 2-7 Mbit/s right? [21:31] <shiftplusone> with 1 resistor for both or two? [21:32] <shiftplusone> hurray, I am not crazy. [21:33] <x^2> you're saying 6? [21:34] <x^2> don't i only need buffers if im going to exceed that amperage? [21:34] <shiftplusone> x^2, I suggest you go to the source and get the information from the horses mouth. [21:35] <shiftplusone> " All the electronics of the pads are designed for 16mA. That is a safe value under which youwill not damage the device. Even if you set the drive strength to 2mA and then load it so16mA comes out that will not damage the device. Other than that there is no guaranteedmaximum safe current." [21:37] <x^2> thats why i'm only using it for LEDs right now, heh. [21:38] <gordonDrogon> most of the time it causes the Pi to reboot. [21:38] <gordonDrogon> most of the time. [21:38] <x^2> breaking the pins in the process? [21:38] <gordonDrogon> some of the time it caues the magic black smoke to leave. [21:39] <gordonDrogon> the "drive strength" is the amount of current you call pull out of a Pi's pin and guarantee that pin is still at a logic 1 level. [21:39] <gordonDrogon> the default drive strength allows for 8mA. [21:40] <gordonDrogon> when you pull more than 8mA then the output voltage starts to fall to a level lower than what's considered logic 1. [21:40] <gordonDrogon> so pulling 16mA is fine, but that's not fine if you also connect another 3.3v logic device to it - it may not see a logic 1 - despite LEDs being lit up. [21:41] <gordonDrogon> get the cheap rht03 or equivalents. [21:42] <gordonDrogon> they take virtually no current and are ok.
[21:42] <x^2> so people directly control them w/ gpio? [21:42] <gordonDrogon> the rht03's yes. [21:43] <gordonDrogon> I think the am2302 is compatible. [21:43] <gordonDrogon> that 17 LED picture is pulling off the 3.3v supply. [21:43] <gordonDrogon> about 10mA per LED. [21:43] <x^2> each one connected to a different pin, right? [21:44] <gordonDrogon> so there's 170mA going through the Pi on the 3.3v rail. [21:44] <gordonDrogon> yes. one on each of the 17 GPIOs. [21:44] <gordonDrogon> I did a lot of testing in the early days. [21:45] <gordonDrogon> That was my first Pi. It took some abuse. [21:45] <gordonDrogon> I've yet to have a Pi of my own actualyl fai. [21:45] <IT_Sean> Not even a single pin? [21:45] <gordonDrogon> nope. all still working. [21:45] <gordonDrogon> I have one Pi that won't reboot though - needs a power cycle. [21:46] <gordonDrogon> so something might have gone awol somewhere, but ..
[21:47] <gordonDrogon> I have 7 right now. I gained one a few weeks ago at a show. [21:47] <gordonDrogon> old Rev 1 with a missing capacitor. [21:47] <gordonDrogon> actually, I might do a test to the death on it. [21:47] <IT_Sean> I have a (lightly modified) Model A, and a pretty much bone stock Model B. [21:48] <gordonDrogon> you have dialup then? [21:50] <ryt0l> speaking of hosting sites on a pi, is there anyone here I can ask a couple questions regarding that? [21:50] <IT_Sean> just ask your questions, ryt0l. If someone can answer, they will. [22:12] <dakira> ShorTie: backups, too. [22:21] <shiftplusone> well... recovered half of it at least. [22:24] <ryt0l> that still needs to be port forwarded right? [22:25] <ryt0l> seems kind of stupid that they would block port 80 because they don't want you hosting sites on a residential connection but leave other ports open for you to do it on? [22:30] <ryt0l> I've read that people can still hose from the pi even when port 80 is blocked, I just don't understand how they're doing it. [22:45] <clever> is it safe to connect a 4.7k pullup to 5v on a gpio pin?, the resistor should limit the current, but does it limit it enough to prevent damage? [22:46] <shiftplusone> a pullup from 3.3v pin to 5v ? [22:49] <shiftplusone> It will work, but it's a bad idea. Current doesn't affect the dielectric strength of the silicon oxide. [22:49] <clever> does it have any clamping diodes like the avr? [22:49] <shiftplusone> Hang on, there was a definitive answer on this from gert, lemme go find it. [22:51] <shiftplusone> IIRC there are diodes, but they're not enough. The pi was designed to be 5v tolerant for very specific applications and gert used to tell people that if they connect a series resistor, they won't damage the pi, but the broadcom people said no, it's not 5v tolerant and should not be treated as such. But let me find the technical details. [22:54] <shiftplusone> clever, I think they're not allowed to say exactly what is and isn't present in terms of the clamping diodes, and the short answer is "It is NOT safe!" [22:56] <clever> dang, no part id on the silkscreen!! [22:56] <shiftplusone> where could you put the diode without modifying the actual module? [22:57] <ShorTie> it doesn't work if you just use 3.3v in stead of 5v ?? [23:06] <clever> but even 1.064mA doesnt feel like it would damage the protection diode? [23:12] <shiftplusone> Is this a raw image or NOOBS? [23:13] <shiftplusone> win32diskimager or dd? [23:13] <clever> shiftplusone: hmmm, the reply on the 16th at 11:51 am says that his pi lacks protection diodes!! [23:14] <shiftplusone> clever, the reply from awagner? [23:15] <shiftplusone> the guy is arrogant and makes a lot of assumptions, so I wouldn't trust what he says too much, although he is an academic and does that sort of thing professionally. [23:15] <phire> aren't the protection diodes built into the SOC? [23:18] <shiftplusone> I don't care to think about it too much, since it just seems like bad design in the first place. [23:19] <shiftplusone> and given that it's a major point of disagreement within the professional community, I doubt I will come to some enlightened conclusion. [23:23] <plugwash> I guess the wire cutters option doesn't appeal? [23:29] <clever> basketball: after you dd it over, does fdisk list a valid partition table? [23:36] <shiftplusone> that would indicate it's borked. [23:36] <shiftplusone> or maybe he doesn't have fat32 support for some reason. [23:38] <shiftplusone> Zylinx, what country? [23:40] <shiftplusone> Zylinx, any Samsung/HTC >1A charger, most Apple chargers, a powerpax charger, something UL listed, something from Farnell. In short, a power supply from a company that you can sue if it burns down your house. [23:44] <shiftplusone> basketballl, First do what clever and phire are saying to make sure the card is sane. However, I actually think it's just an incompatible card. You can try plugging it into the pi and holding it down to the board with your thumb as you power it up and see if the ACT LED flashes at all. But first listen to the others. [23:48] <kay-z> I'm trying to get avahi to broadcast it's presesence to my local network but so far no dice. are there special things that have to be done to enable it on a 'pi ? [23:49] <shiftplusone> Zylinx, are you plugging a wifi stick in or anything like that? [23:49] <shiftplusone> no powered hub? [23:49] <kay-z> clever: what os? [23:50] <clever> but mac may not have that? [23:52] <Laseryoda> Hey all. Will http://www.seagate.com/gb/en/external-hard-drives/desktop-hard-drives/expansion-hard-drive/?sku=STBV2000200#specs work well as a HDD for RPI? [23:54] <kay-z> clever: mac equiv found it. [23:55] <clever> is it running on the pi? [23:55] <shiftplusone> Zylinx, the sd wouldn't cause reboots. [23:56] <clever> kay-z: try restarting the service maybe? [23:56] <shiftplusone> Zylinx, a reboot implies a surge of power that the supply and circuitry can't cope with. Does it happen without the wifi stick? [23:57] <Zylinx> phire what about 9.81 is that calling it close ? [23:58] <shiftplusone> Zylinx, you'll only see problems under 4.75, and even then it won't be reboots, but hanging. [23:58] <DoctorD90> guys, what is the real difference between a pin ...any pin of gpio, and sda pin? [23:59] <shiftplusone> phire, without ethernet, right? [23:59] <shiftplusone> and it's stable?